Austrian director Michael Haneke's quiet masterpiece Love was an early favourite for the top award since it was shown in Cannes last week. The heartbreaking story of an elderly husband caring for his ailing wife is beautifully written and shot and features two understated, powerful performances from octogenarian actors Jean-Louis Trintignant and Emanuelle Riva. Slow-paced but never sinking into melodrama, the film addresses universal fears of ageing and infirmity and, at its heart, is a moving portrait of love both in its complexity and its simplicity. 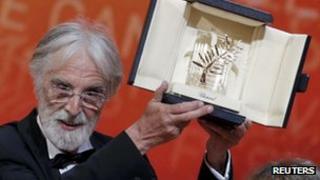 Haneke won the Palme d'Or in 2009 for his film The White Ribbon, which went on to win a Golden Globe and receive an Oscar nomination. Love could follow a similar path. The Grand Prize, considered the competition's runner-up award, was won by Matteo Garrone's Italian satire Reality. Carlos Reygadas was named best director for the surrealist tale Post Tenebras Lux. Loach's latest is a very different film to gritty Irish war drama The Wind That Shakes the Barley, which won the Palme d'Or in 2006. Speaking from Cannes, Ken Loach told BBC Radio Four's Today Programme: "It's about a handful of those people who face a life with no real place in society because there is so much unemployment. "Underneath the humour is the point that this is a tragedy we've inflicted upon a generation and it doesn't have to be this way, it's not inevitable. "But the economic system drives us to this and that's not acceptabl. We need to resist." He said the biggest divisions had been over Leos Carax's surreal time-travelling Holy Motors - tipped by many as a potential Palme recipient - and Ulrich Seidl's drama Paradise: Love.